Pure-Aire’s Mist Eliminators remove oil mist and particulate to protect the investment in your plant equipment, improve your product quality, and reduce your energy costs. The extremely low pressure differential and extended element life reduce energy costs and maintenance intervals. The Mist Eliminators remove oil carryover from oil-lubricated compressors. The benefits of a 0.5 psid pressure differential, and service life of 7 to 15 years exceed all standard filtration. The use of a Mist Eliminator assures additional protection from a catastrophic failure inside an oil lubricated compressors separator systems oil-systems. Oil & particulate free compressed air. Ultra-low pressure drop reducing operating costs – 0.5 psi. Service Life – 7 to 15 years in normal service. 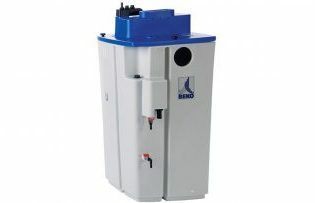 High Efficiency Filtration – Removal of solid particles to 0.1 to 3.0 micron at 99.98% efficiency to 0.5 ppm by weight. Filtration media is designed for a high load factor compared to conventional filters, providing 11–16 times greater filtration surface area, greater dirt holding capability, and lower pressure drop. The Mist Eliminator’s pressure drop design is the lowest available at 0.5 psi which is typically 4 to 6 psid lower than conventional filters. This provides significant energy savings, based on the rule of thumb for every 2 psi pressure drop that is eliminated, a 1% energy reduction in compressor horsepower is achieved. Pure-Aire Mist Eliminators PDF are available from 500 to 10,000 scfm, Vessel design 150 psig.